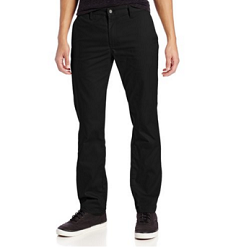 The Volcom modern stretch chino pant is perfect for the skate park or the office. This chino is made from a comfortable cotton and polyester blend with a little stretch to make sure you get a full range of motion. Loaded with details like custom stone embroidery on the inside left leg, Volcom flag tag on back right pocket and an asymmetrical back yoke, this is the plant that will set you apart.